Our core belief is to deliver laser printer cartridges that are at the best quality for your laser printer. Purchase at Cartridge Save to get a comprehensive stock of cheap laser toner cartridges for LaserJet 4730 laser printers currently on offer! We are very serious about delivering brilliant value on top of industry-beating customer satisfaction. You'll receive free delivery for every toner ordered with Cartridge Save. Cartridge Save take speedy delivery very seriously, meaning 98% of all orders arriving the very next day. In order to give you greater peace of mind, every HP LaserJet 4730 laser printer cartridge you order here also incorporates our complete refund policy. Go shopping confidently every day at Cartridge Save! Suitable for small to medium-sized offices, the HP Colour LaserJet 4730 is an ideal multifunction printer. Aside from delivering good quality prints at amazing speed, it can also offer excellent copying and scanning. The HP Colour LaserJet 4730 series use laser colour printing technology and has a maximum print resolution of 600 x 600 dpi. This multifunction printer does not have a fax machine. Offices should make room for the HP Colour LaserJet 4730 laser printer as it has dimensions of 1153 x 639 x 788 mm and weighs 124 kg. The HP 4730 Colour LaserJet printer has a 100-sheet multipurpose tray along with 3 500-sheet input trays. The flatbed scanner is on top and it has an automatic document feeder on the cover. Print speeds can go as fast as 30 ppm for both black and white and coloured prints. With the HP Colour LaserJet 4730 multifunction printer, offices can save a lot of money as it has time-saving and paper waste-reducing features including the automatic duplexer and the automatic document feeder. Users can expect good quality output time and time again delivered in quick speed by the Colour LaserJet 4730. For networking, the HP 4730 Colour LaserJet has built-in Ethernet. Unlike other multifunction printers, the HP Colour LaserJet 4730 all-in-one colour laser does not have a built-in fax machine. 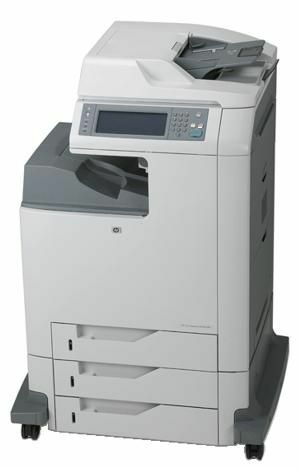 The HP 4730 colour laser printer is also quite bulky and does not have Wi-Fi capabilities.